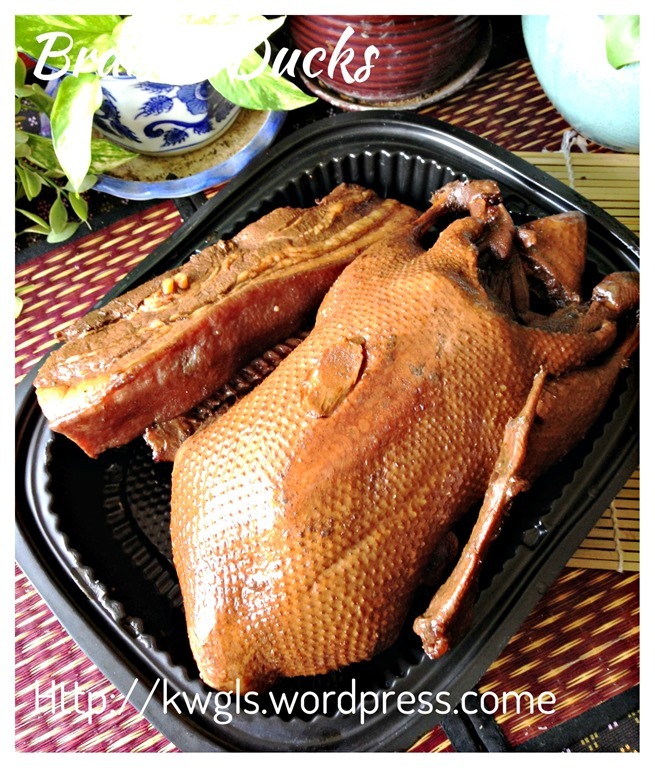 There are many many recipes of Teochew style braised ducks.. and every household will claim that his or her recipe is the best..However, I dare not to claim that mine is the best or the most authentic as it all depends on individual taste buds. 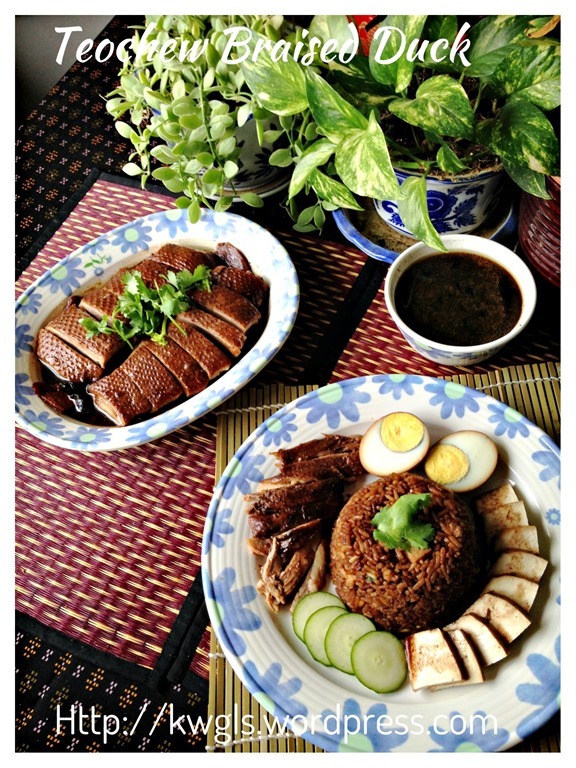 I hope this family recipe will kick start reader to search for a braised duck recipe that suits you. 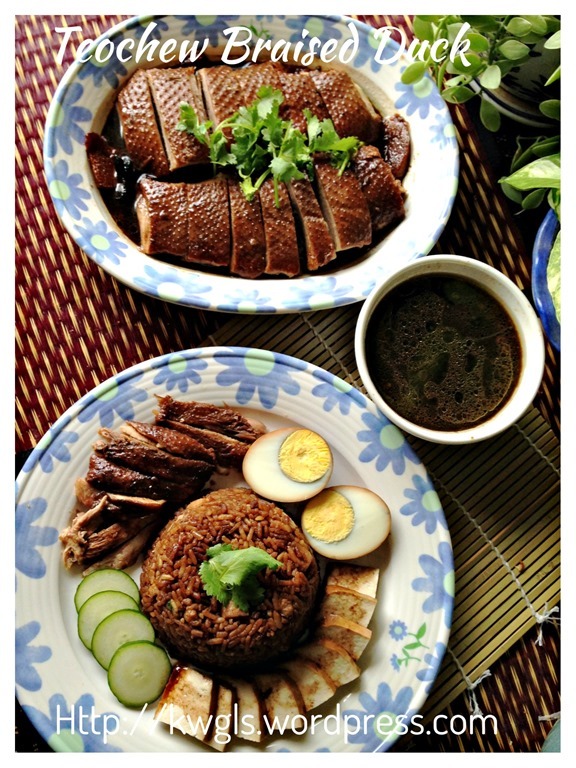 Throughout my many years in this world, I have eaten many many braised ducks from relatives to friends to Teochew restaurants or even at the place of its originality – Chaozhou Province of People’s Republic of China.. 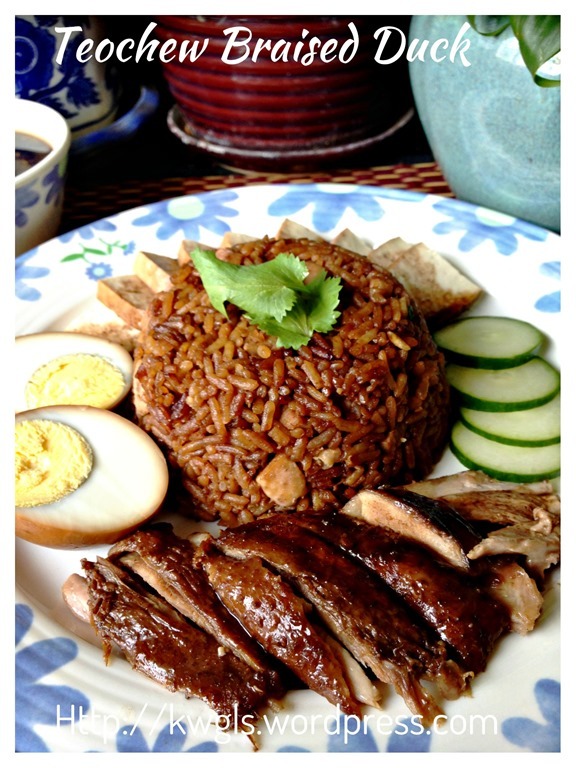 I like my braised duck to be on a sweeter side and I have tasted braised duck that are very salty… Some are lighter in colour and are as dark as dark chocolate… Some are juicy but some are very dry.. Whatever it is, it is individual preference and it very much depends on your family’s preference. None shall claim that theirs is the best or authentic. 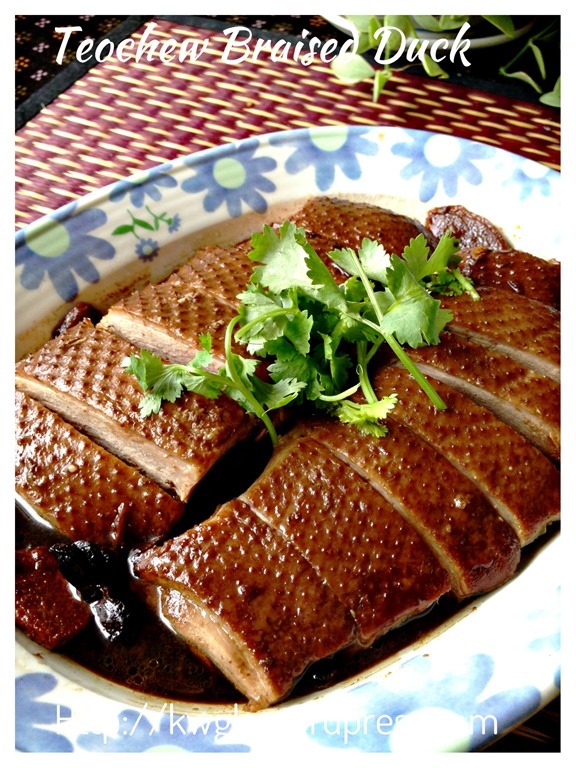 Possibly because of the difference species of duck, braising duck is quite a tedious affair then, it need a few hours to braise a duck. 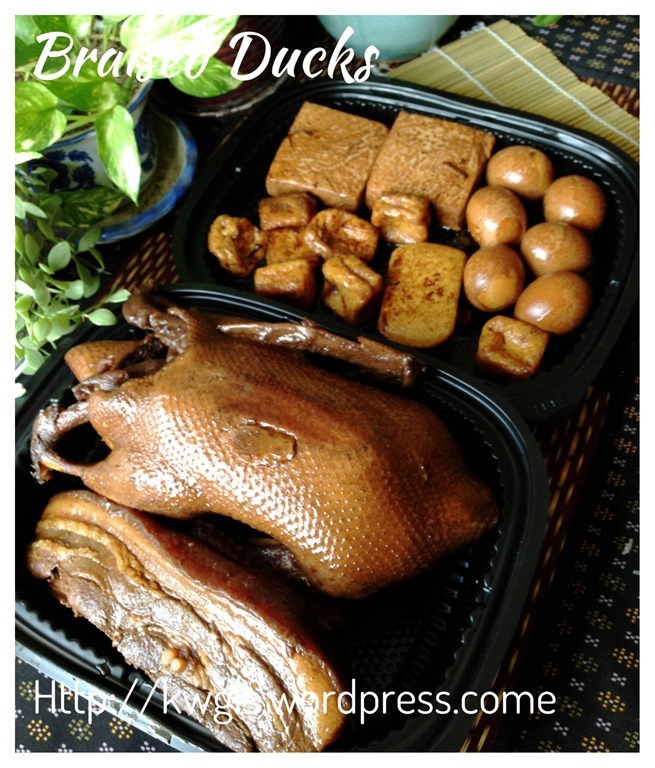 At times, special big wok was necessary to braise 2-3 ducks together so as to save some times… Unsure of the reasons, ducks in Singapore are relatively cheap and very easy to get cooked. Together with the use of gas stoves and better cooking utensils, the time of braising have reduced significantly. Braising duck is not difficult, but you need a wok big enough for you to submerge at least half a duck… I don’t usually cooked it in this way. If not for this illustration, in normal days, I will use the short cut method of braising using pressure cooker and use ready made sauces.. But for the purpose of this post, I have decided to braise the duck in a rather traditional manner, including caramelization of sugar to enhance the fragrance and colour of gravy..In my humble opinion, this is a rather complete post to honour this traditional cuisine. As this is a savoury dish, the spices are for your reference and a bit more or less is acceptable depending on individual family’s taste bud. 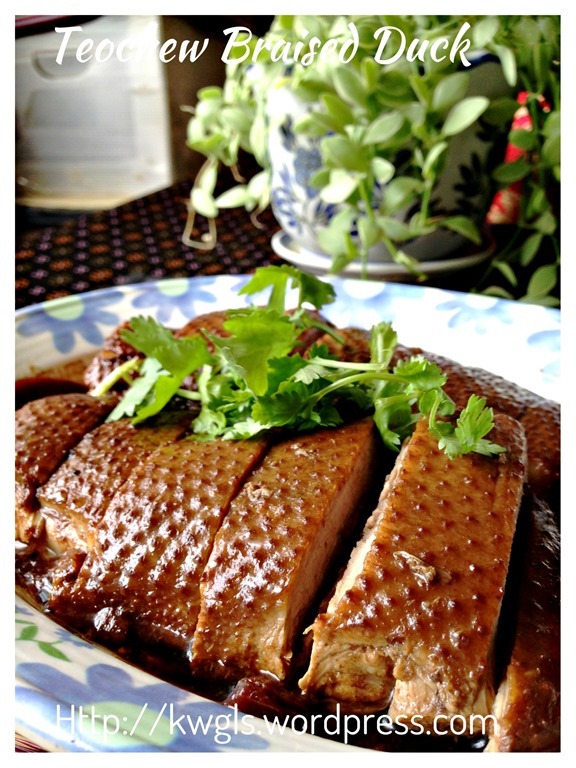 Use some of the soya sauce and 5 spice powder to rub the duck and marinate the duck for at least 30 minutes to one hour. 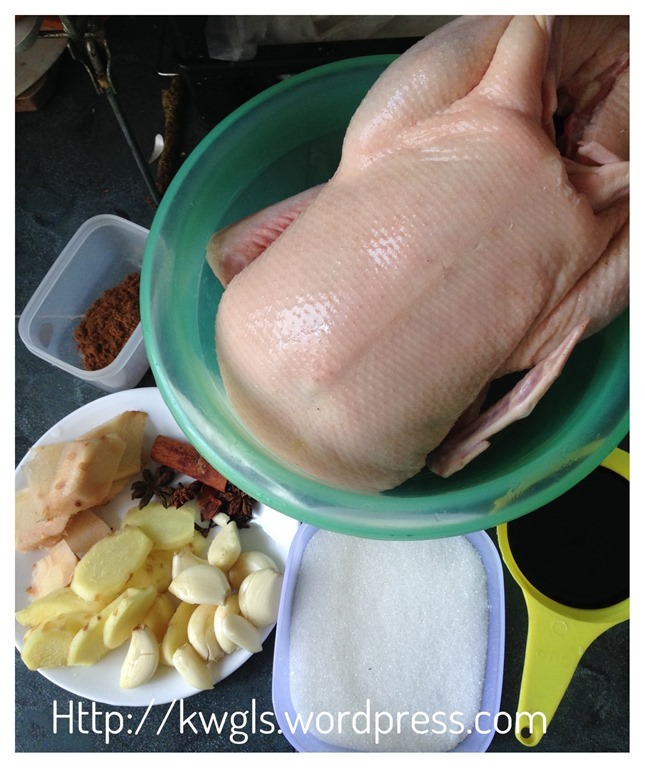 The main purpose of this step is to ensure even colouring of the duck. The longer it is, tastier will be your duck. Once marinating has been done, in a big wok, sauté the garlics, galangal, ginger, cloves, cinnamon and star anise until fragrant (about 3-4 minutes). Add in the castor sugar. Stir fry until the sugar caramelizes and turn brownish (note the colour changes in between the pictures). Depending on your liking, you can caramelize the sugar until the shade of dark chocolate. Add in some water and stir until the sugar dissolves. Don’t worry that the sugar crystalizes as it will dissolve again but be careful of adding water to the hot oil. You should have a brownish shade of braising liquid. Add the marinated duck. Gather all the marinating soya sauces and five spice powder in the bowl and put it back to the wok. Add in all the remaining dark soya sauce and five spice powder. Bring the liquid to boil and braise the duck for about one hour under medium heat. Turn the duck on every 15 minutes interval to ensure that the duck is evenly cooked and coloured. Use a skewer to insert into the thickest part of the meat (suggested: drumstick) and ensure that it can be inserted easily and no blood water coming out from the duck. 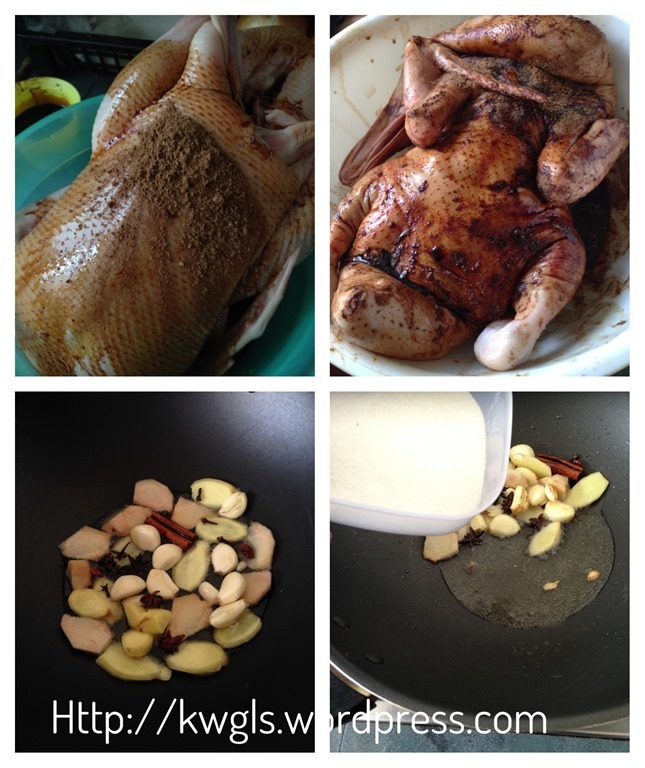 You can serve the duck immediately when it is cooked. However, it is advisable to let it rest in the gravy for 5-6 hours or even overnight before cutting into pieces and served with garlic ginger vinegar. 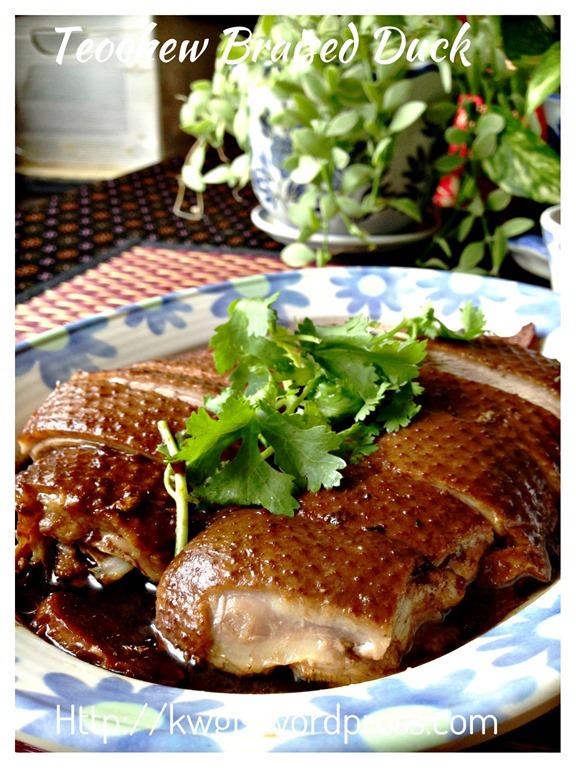 Braising duck is a form of preservation, for the first night, resting can be one on the wok in the braising gravy without refrigeration. 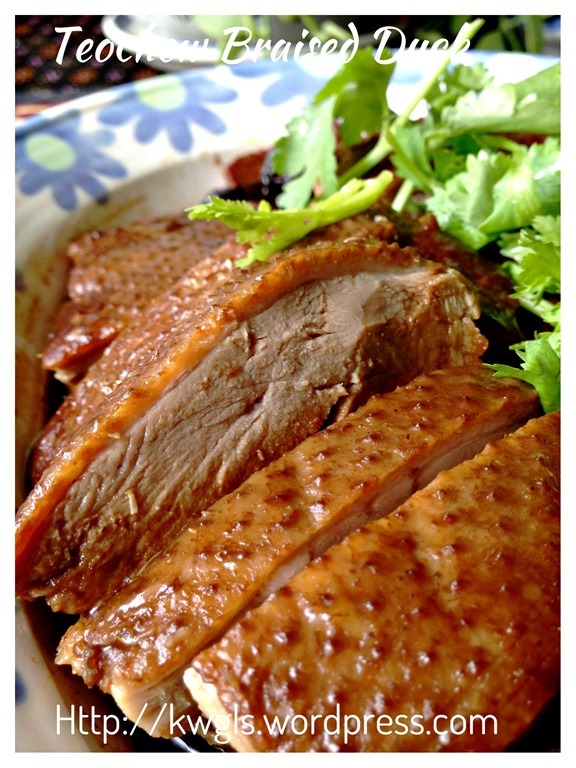 This resting will also help to colour and enhance the flavour of the duck. 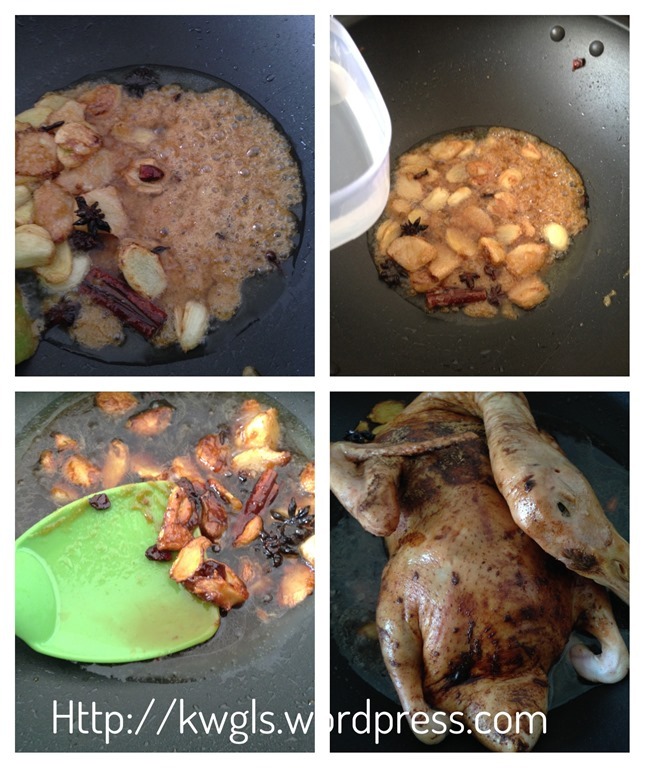 If you do not have a big wok, you can cut the duck into 4 big pieces and braised in a big pot. Depending on your taste buds, you can always take a spoon of gravy to taste if this is what you are looking for. Otherwise, do feel free to add in more spices and condiments to enhance the flavour of your gravy. You can by passing the caramelization of sugar and use brown sugar or even palm sugar instead. This is the traditional method as caramelized sugar gave a distinct smell and colour. If you are braising the whole duck, you should have a lot of braising gravy left. The braising gravy can be used to braised firm bean curd, bean curd puff, hard boiled eggs, pork belly, fish cakes and etc.. The gravy can be refrigerated and used for the preparation of lor mee (braised noodles), kuih chap (flat rice noodles), braised duck yam rice or even used it to cook with mei cai. 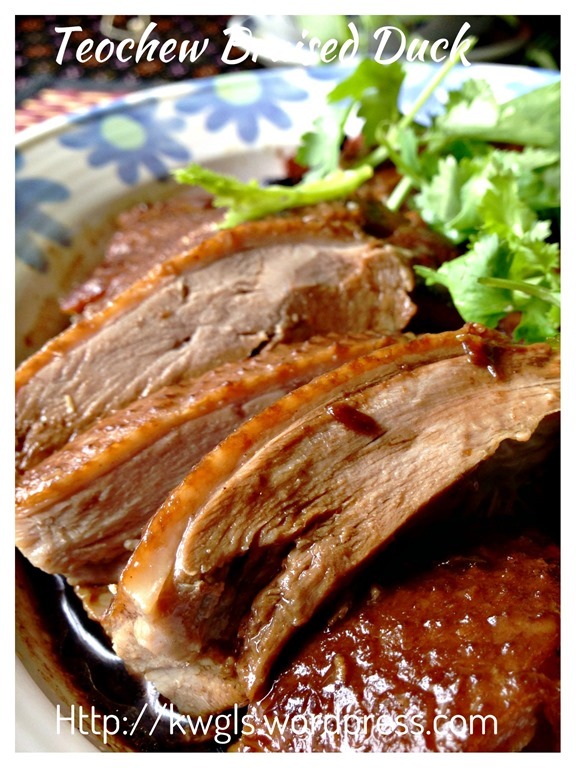 This is the more complicated and long winded recipe of braised duck in a traditional manner. I prepare this as a respect to what my elders have done. In current years, I usually cut into smaller pieces and use ready made braised spices, throw all in and braised or cooked in the pressure cooker. 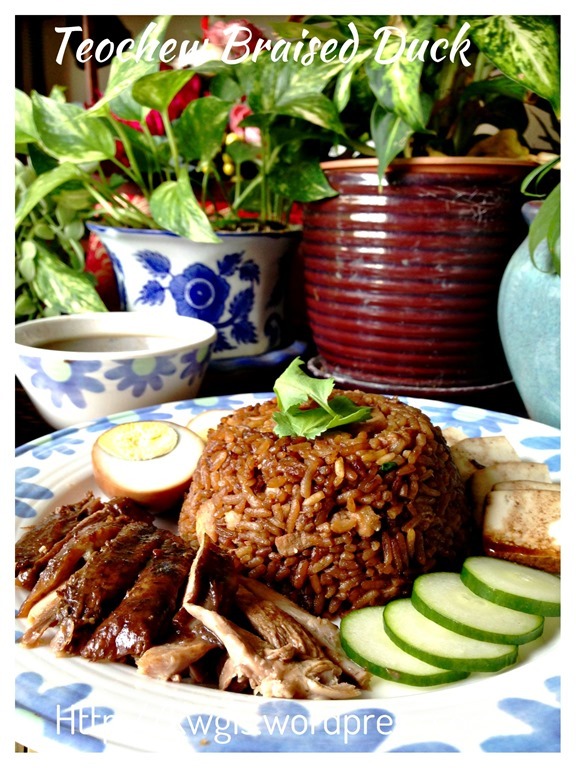 So don’t be deterred if you find this troublesome.. there are always short cut available that yields equally delicious Teochew braised duck. But after reading this post, I hope you have a better understanding of what our elders have done during the preparation of this delicious dish. 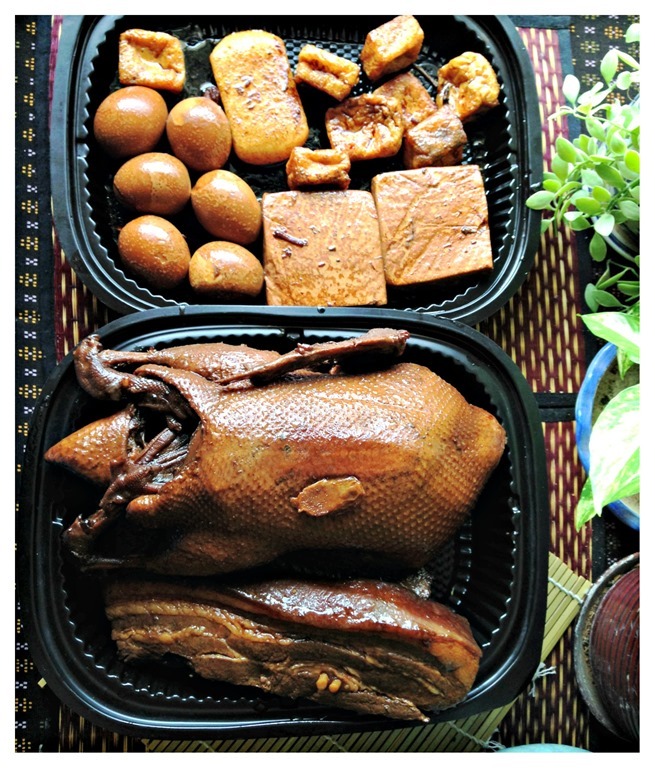 This entry was posted in Food Preparation Series, Meat Dishes and tagged 8, Chaozhou lor ark, GUAI SHU SHU, Guaishushu, kenneth goh, lor ark, postaday, Teochew Braised duck, 卤鸭, 卤水鸭. Bookmark the permalink. Hi Kenneth, great duck & i cannot wait to cook it for my family. 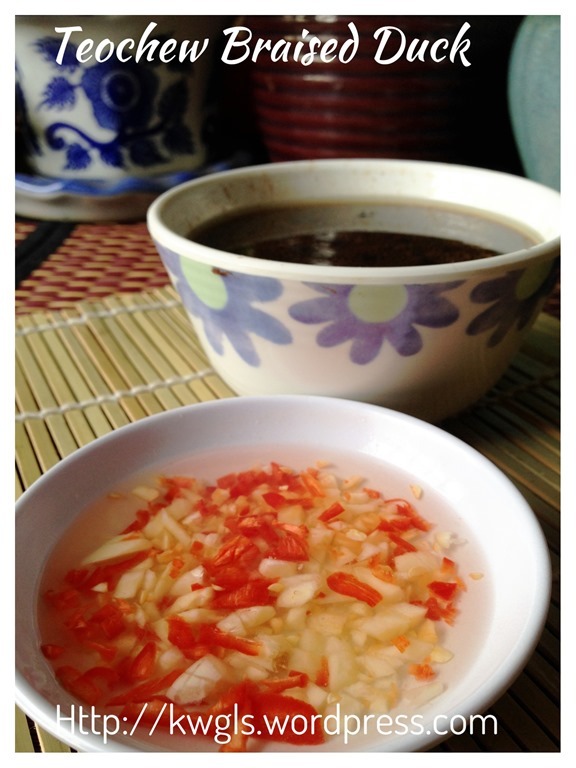 Can i check how u make the chili garlic vinegar dipping sauce for the braised duck? Thanks! Just add minced garlic and chilli to the vinegar.. that is it. My mom makes this for us all the time. We love love it. So glad to see your blog. One question, what is galanga? Hi ! I follow your recipe for the braised duck but the sauce taste a lil sourish . Is there a reason why ? I added extra lemon grass and black peppercorn though. Sour? Sour? I am puzzling.. Could it be the type of brown sugar used? or contaminated? This meal made a really good gravy. 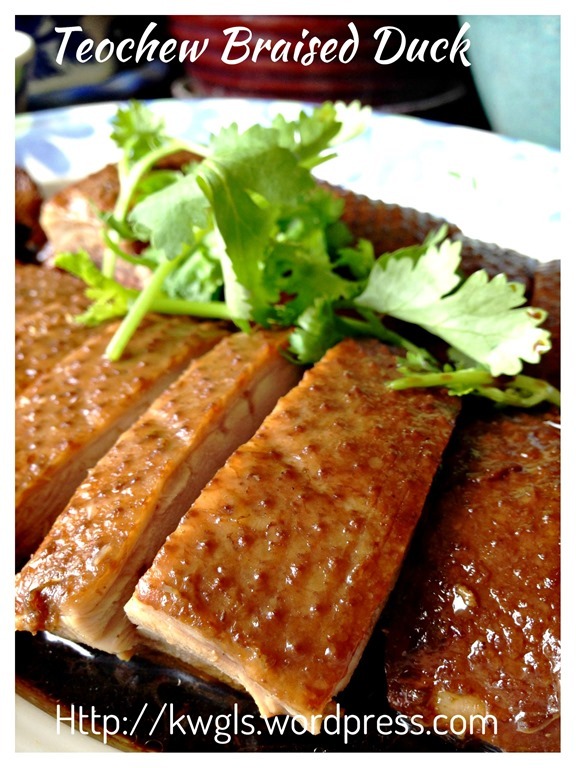 I just find it difficult to get that same crispy juiciness I would get from duck in Hong Kong. Do you have a technique to share to get that skin consistency? There is a possibility .. Chances are there.. taste are individual preference.